for as long as i can remember, i’ve been a person who loves to travel. and i don’t just mean the being in another place and enjoying your time there – it includes the actual act of traveling itself. even as a kid i used to enjoy laying my clothes out on the bed and choosing the books that i wanted to take with me, before packing it all efficiently in a cute suitcase or bag. admittedly, back then ‘packing’ just meant ‘cramming’ and ‘efficient’ meant ‘as much as possible’. i’m still not what you’d call a light packer, though i’ve made some strides in the right direction over the past few years. experience has taught me to assess what i’ll actually wear at a destination, and what i’ll need on the way over there. nevertheless i’m always super interested when my favorite bloggers show their travel essentials (like mija and shini) and i felt inspired to start a new series to do the same. as this is the first post in the series, i wanted to start with one of my top priorities – proper hydratation. 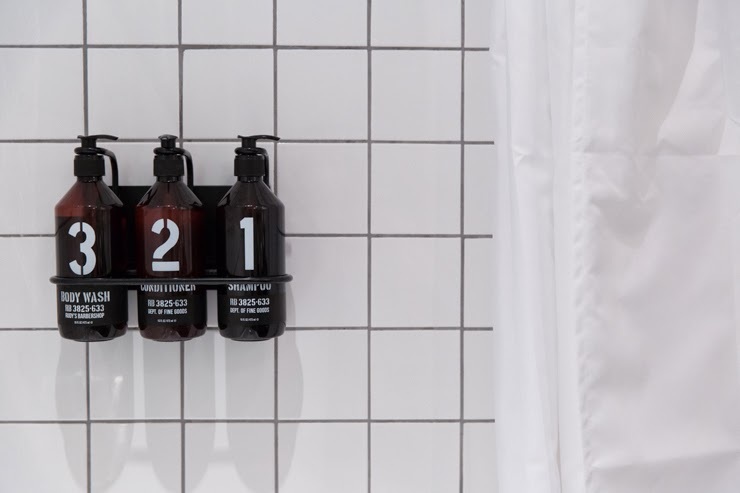 traveling by plane, going to different time zones and altitudes, switching between seasons – all of these things wreak havoc on your skin, so i always try to bring my entire skin routine with me. 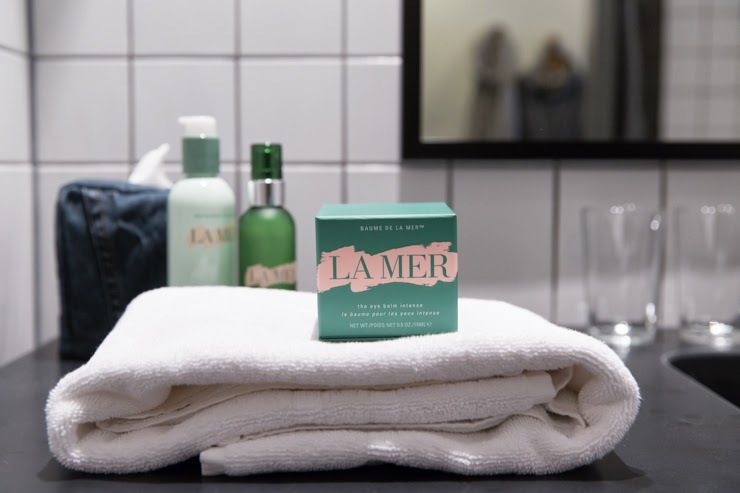 you might remember i collaborated with beauty boutique parfuma last year – they helped me discover the virtues of la mer. i was instantly hooked. yes, the products are expensive, but they also last a long time. i’m still using the serum and make-up remover i got late last spring, and i think they’ll eventually last me a year. obviously the creams run out faster as i use them day and night, but the difference they’ve made is pretty much priceless. if i were forced to choose one favorite – not exactly sophie’s choice, but still, pretty harsh! – i’d go for the eye balm without a second of hesitation. 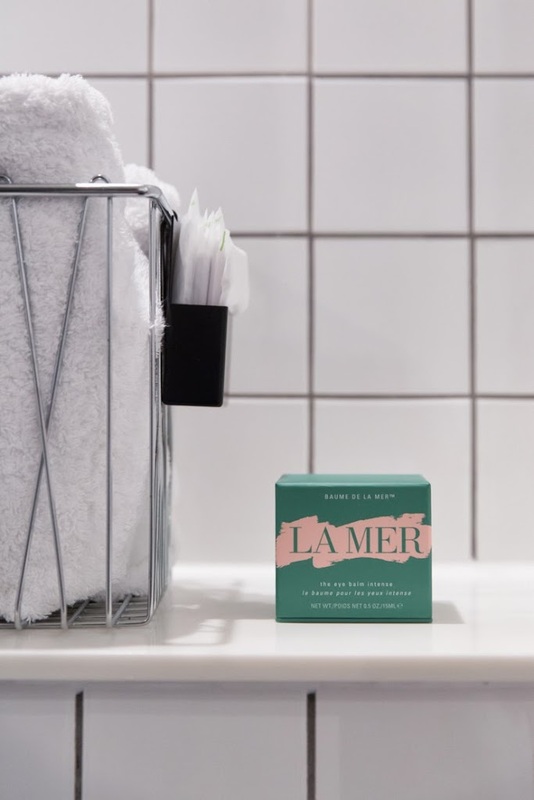 it has the exact right consistency for me – nice and buttery, but not so rich that it actually develops bags under my eyes (some eye creams do that!) you only need to use a tiny little bit, so the pot lasts a long time, and i’ve really seen the skin around my eyes change since i’ve started using it. it’s soft and supple, and though exisiting lines of course didn’t disappear, i certainly didn’t notice any new ones creeping up. 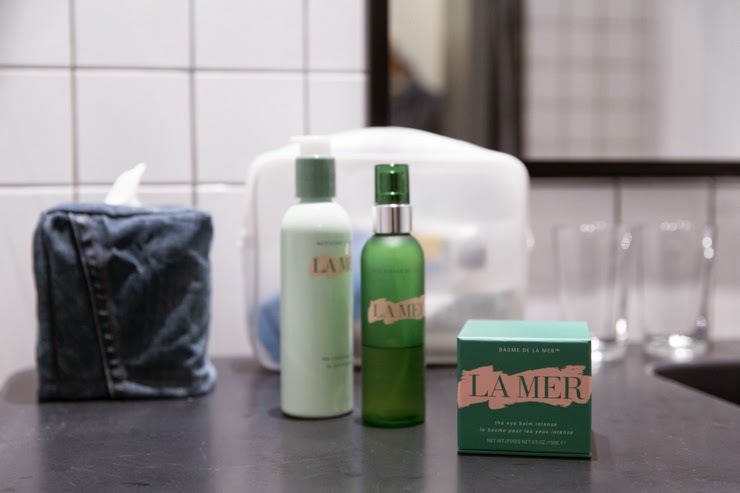 i even use the balm on rough patches on my face, after a day of skiing in the freezing cold for example, and i’ve also used it on tiny little scars that have since visibly improved. to me, this balm truly is a miracle cream and totally justifies the steep price tag. 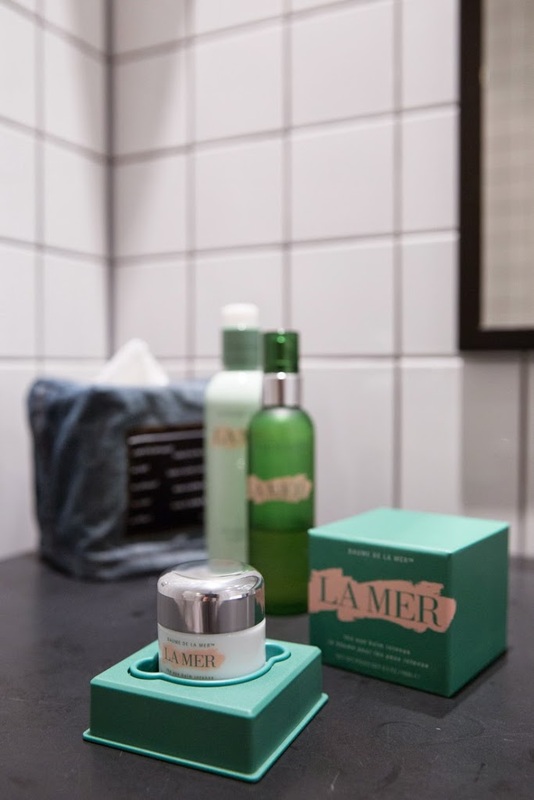 and look at the pretty box it comes in – opening a new package in the bathroom of our room at the ace hotel in london recently felt like spoiling myself in every possible way. 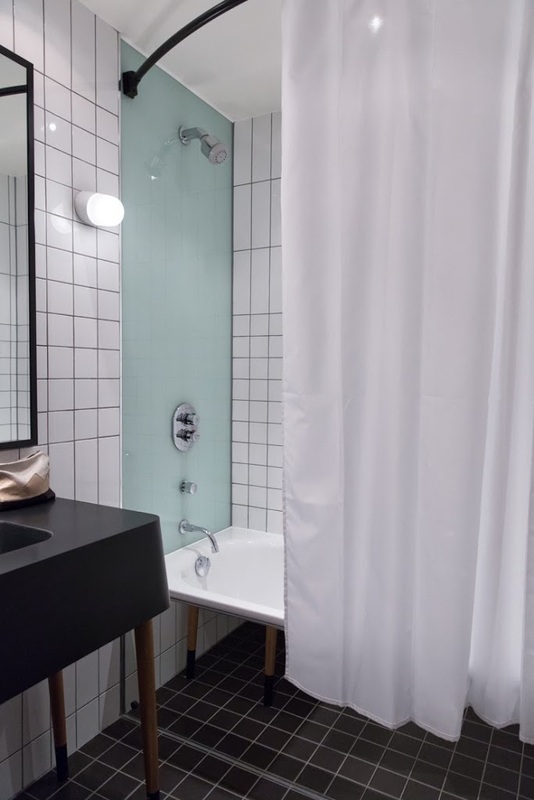 let’s talk about that bathroom, too! CONNECTIONS put us up at the ace hotel while we were in london to make a city guide for them, and i absolutely LOVED it. it actually reminded me a lot of the one in new york. i’m telling you, this chain just keeps getting better and better at what they do. i’ve visited all of their locations except for the newest one in los angeles (which is obviously super high on my list) and i recommend them all to anyone who will listen.